The AudioPlayer interface provides directives for controlling audio playback through voice, and events to manage and monitor playback progression. If you are looking to map playback controls to buttons (physical or GUI), please reference the PlaybackController interface. The following diagram illustrates state changes driven by AudioPlayer components. Boxes represent AudioPlayer states and the connectors indicate state transitions. IDLE: AudioPlayer is only in an idle state when a product is initially powered on or rebooted and prior to acting on a Play directive. PLAYING: When your client initiates playback of an audio stream, AudioPlayer must transition from an idle state to playing. If you receive a directive instructing your client to perform an action, such as pausing or stopping the audio stream, if the client has trouble buffering the stream, or if playback fails, AudioPlayer must transition to the appropriate state when the action is performed (and send an event to AVS). Otherwise, AudioPlayer must remain in the playing state until the current stream has finished. While in the paused or buffer_underrun states, AudioPlayer must transition to stopped when a ClearQueue directive to CLEAR_ALL is received. AudioPlayer must transition from stopped to playing whenever your client receives a Play directive, starts playing an audio stream, and sends a PlaybackStarted event to the AVS. PAUSED: AudioPlayer must transition to the paused state when audio on the Content channel is paused to accommodate a higher priority input/output (such as user or Alexa speech). Playback must resume when the prioritized activity completes. For more information on prioritizing audio input/outputs, see Interaction Model. BUFFER_UNDERRUN: AudioPlayer must transition to the buffer_underrun state when the client is being fed data slower than it is being read. AudioPlayer must remain in this state until the buffer is full enough to resume playback, at which point it must return to the playing state. FINISHED: When a stream is finished playing, AudioPlayer must transition to the finished state. This is true for every stream in your playback queue. 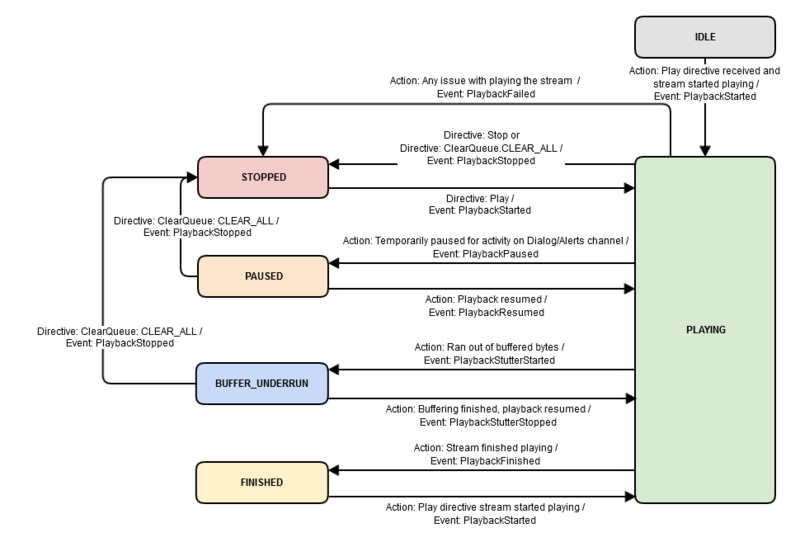 Even if there are streams queued to play, your client is required to send a PlaybackFinished event to AVS, and subsequently, transition from the playing state to finished when each stream is finished playing. The next stream in the playback queue starts playing (following a PlaybackStarted event). To use version 1.0 of the AudioPlayer interface, it must be declared in your call to the Capabilities API. For additional details, see Capabilities API. Alexa expects a client to report playerActivity (state), and the offsetInMilliseconds for the currently playing media item with each event that requires context. playerActivity Identifies the component state of AudioPlayer. IDLE Nothing was playing, no enqueued items. FINISHED Stream was finished playing. The Play directive is sent to your client to initiate audio playback. It is a multipart message comprised of a JSON directive, and up to one audio stream or binary audio attachment. Note: Learn more about Binary Audio Attachments. REPLACE_ALL: Immediately begin playback of the stream returned with the Play directive, and replace current and enqueued streams. When a stream is playing and you receive a Play directive with a playBehavior of REPLACE_ALL you must send a PlaybackStopped event to AVS. ENQUEUE: Adds a stream to the end of the current queue. Note: When adding streams to your playback queue, you must ensure that the token for the currently playing stream matches the expectedPreviousToken in the stream being added to the queue. If the tokens do not match the stream must be ignored. However, if no expectedPreviousToken is returned, the stream must be added to the queue. Play directives may have a corresponding binary audio attachment as one part of the multipart message. When a binary audio attachment is present, the value provided for url will include the following prefix: cid. Important: Your client must be designed to accommodate and act on all payload parameters supported by Play, and must not break if key/value pairs in the JSON are missing. playBehavior Provides playback hints. Accepted values: REPLACE_ALL, ENQUEUE, and REPLACE_ENQUEUED. REPLACE_ALL: Immediately begin playback of the stream returned with the Play directive, and replace current and enqueued streams. audioItem.stream.streamFormat streamFormat is included in the payload when the Play directive has an associated binary audio attachment. This parameter will not appear if the associated audio is a stream. The PlaybackStarted event must be sent to AVS after your client processes a Play directive and begins playback of the associated audio stream. Tip: As a best practice, you may want to consider waiting until the previous song has buffered before sending a PlaybackNearlyFinished event to Alexa. This lowers the risk of exceeding the expiryTime and can reduce the frequency of playback stutters that may occur when downloading and processing multiple Play directives at the same time. The ProgressReportDelayElapsed event must be sent to AVS if progressReportDelayInMilliseconds is present in the Play directive. The event must be sent once at the specified interval from the start of the stream (not from the offsetInMilliseconds). For example, if the Play directive contains progressReportDelayInMilliseconds with a value of 20000, the ProgressReportDelayElapsed event must be sent 20,000 milliseconds from the start of the track. However, if the Play directive contains an offsetInMilliseconds value of 10000 and progressReportDelayInMilliseconds value 20000, the event must be sent 10,000 milliseconds into playback. This is because the progress report is sent from the start of a stream, not the Play directive's offset. The ProgressReportIntervalElapsed event must be sent to AVS if progressReportIntervalInMilliseconds is present in the Play directive. The event must be sent periodically at the specified interval from the start of the stream (not from the offsetInMilliseconds). For example, if the Play directive contains progressReportIntervalInMilliseconds with a value of 20000, the ProgressReportIntervalElapsed event must be sent 20,000 milliseconds from the start of the track, and every 20,000 milliseconds until the stream ends. However, if the Play directive contains an offsetInMilliseconds value of 10000 and a progressReportIntervalInMilliseconds value of 20000, the event must be sent 10,000 milliseconds from the start of playback, and every 20,000 milliseconds after that until the stream ends. This is because the interval specified is from the start of the stream, not the Play directive's offset. The PlaybackStutterStarted event must be sent to AVS, following a PlaybackStarted event, when the client's AudioPlayer component is being fed data slower than it is being read. The component must transition to the buffer_underrun state once this event has been sent and remain in this state until the buffer is full enough to resume playback. The PlaybackStutterFinished event must be sent to AVS when the buffer is full enough to resume playback of a stream. AVS doesn't expect a subsequent PlaybackStarted event when audio playback resumes. The PlaybackFinished event must be sent to AVS when your client finishes playback of a stream. The PlaybackFailed event must be sent to AVS whenever your client encounters an error while attempting to play a stream. It is possible for the currentPlaybackToken to be different from the token in the payload in cases where a stream is playing and the next stream fails to buffer. playbackState.playerActivity Identifies the player state. MEDIA_ERROR_INVALID_REQUEST The server recognized the request as being malformed. MEDIA_ERROR_SERVICE_UNAVAILABLE The client was unable to reach the service. MEDIA_ERROR_INTERNAL_SERVER_ERROR The server accepted the request, but was unable to process the request as expected. MEDIA_ERROR_INTERNAL_DEVICE_ERROR There was an internal error on the client. The Stop directive is sent to your client to stop playback of an audio stream. Your client may receive a Stop directive as the result of a voice request, a physical button press or GUI affordance. Note: This event is only sent when a stream is terminated as a result of receiving one of the directives listed above. Typically, this is the result of a user action. This event must not be sent when a stream has finished playing (see PlaybackFinished). The PlaybackPaused event must be sent when your client temporarily pauses audio on the Content channel to accommodate a higher priority input/output. Playback must resume when the prioritized activity completes; at which point your client must send a PlaybackResumed event. For more information on prioritizing audio input/outputs, see Interaction Model. Note: PlaybackPaused should be sent after a Recognize event to reduce latency. The PlaybackResumed event must be sent to AVS when playback resumes following a PlaybackPaused event (when playback is temporarily paused on the Content channel to accommodate a higher priority input/output). For more information on prioritizing audio input/outputs, see Interaction Model. The ClearQueue directive is sent from AVS to your client to clear the playback queue. The ClearQueue directive has two behaviors: CLEAR_ENQUEUED, which clears the queue and continues to play the currently playing stream; and CLEAR_ALL, which clears the entire playback queue and stops the currently playing stream (if applicable). clearBehavior A string value used to determine clear queue behavior. The PlaybackQueueCleared event must be sent to AVS after your client handles a ClearQueue directive. If metadata is available for an audio stream that your client receives and starts playing: your client should take the key/value pairs received as raw data and translate those pairs into a JSON object. In this JSON object, strings and numbers should be represented as JSON strings, and booleans should be represented as JSON booleans. Your client should filter out any tags containing binary data. For example, your client should not send the image, image preview, attachment, or application data tags to AVS.